Find My iPhone and Find My iPad are security features that make it simple to locate lost iOS devices by tracking them on maps through GPS. A potential problem is that after a device has been lost, or perhaps more accurately, after a device has been stolen, GPS or Find My iPhone can be turned off which thereby disables the Find My iPhone service’s ability to track the missing device. A great fix for that is to use iOS Restrictions to prevent Location Services from being turned off at all, which basically forces GPS and Find My iPhone to stay on all the time. This means that as long as the device is turned on, GPS will be on, making it trackable the entire time. Be sure you have gone through the process to set up Find My iPhone first, then proceed with the instructions below to lock down Location Services. With this configured, there is now an additional layer of protection for the device with GPS and Find My iPhone forcibly left on. And yes, this works the same on an iPad or iPod touch too, though the accuracy of the Find My service is not going to be as reliable on a wi-fi only device, and thus we’re focusing on the iPhone here. It’s a good idea to use a different password for accessing Restrictions than you do for your lock screen password, and if you’re traveling, prone to losing devices, or in a high risk theft area, consider placing a lock screen message on the device with your ownership information on it, which makes it particularly easy to return should a nice person get ahold of the phone. But there’s no restriction on air plane mode? Will this hurt battery life with GPS always on? That’s a pretty self-explanatory question isn’t it …. Another equally important tip is to lock “accounts” under restrictions. Without this done a thief can simply delete the entire iCloud account, which would prevent you from being able to track your phone. 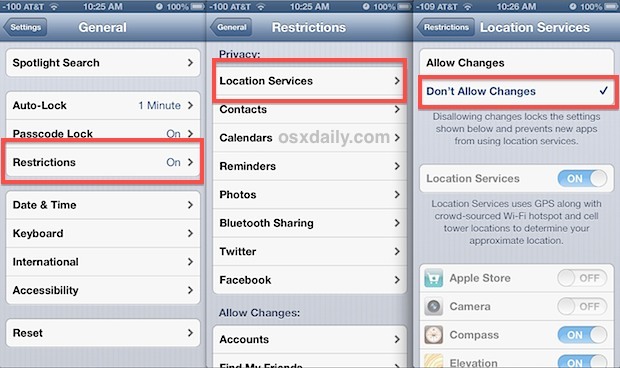 Lock both location services and accounts and you have a much better chance of retrieving your lost or stolen iPhone. Not that this would be an issue, but by locking accounts, it will lock you out of all iCloud, Photo Stream, iMessage, FaceTime, Twitter, iTunes & App Store, and FaceBook settings. Ridiculous byproduct of this: Even with Location Services disabled for Weather (thereby hiding Local Weather and the next city card is shown in Notification Center0, when Location Services are globally locked, Local Weather is unhidden (while still technically being disabled) and just fails to load any data since it’s locked in both the app and Notification Center. That’s dumb. Is it me or is by doing this drains your battery faster? No. Nothing actually changes. It just disallows anyone making changes to it. It essentially locks access to the settings you already have in place. Another (potential) stupid question: if your phone is locked, how are the bad people going to do any of the potential bad things? This would be a potentially helpful solution for people (like me) who prefer not to use a passcode, but still desire to keep some level of security to use Find My iPhone. Not everyone uses a passcode, but also most people that do use simple ones that are easy to guess. You could even set a ‘trap’ by not using a passcode but using and locking down Find My iPhone so that the iPhone is always findable. This won’t drain the battery any more than usual BTW, it doesn’t do anything except lock the setting to stay on. Do you have a similar solution for a MacBook Pro and an iMac? Good question, I would like this too. Just a thought, what would prevent someone from throwing the phone in to recovery/DFU mode and just flashing the OS back on the device? I have the ability to power off the phone while the lockscreen is enabled. I see the value in this but it just seems like you can work around all of the prevention methods. Most crooks are not bright enough to know about DFU/recovery mode. Plus if you’re smart, you’ve written your device serial number down somewhere, you go to an Apple store, give it to them, they’ll add it into their system and when it pops up they’ll be notified its location and they can help you recover it. Password protect your phone, use find my iphone, and always have it backing up to icloud just in case the unfortunate happens.